We prefer to purify our own water at our premises to ensure it is the best quality, rather than buying from outside sources. Mains water is firstly softened before running through a bank of solids filters. It is then pumped at high pressure through three reverse osmosis membranes before being deionised in a resin bed. We then bulk store the water ready to be pumped into the van tanks as required. Our vehicles are equipped with pumps and up to 100-metres of micro-bore hoses to send the water to the carbon fibre poles up to a height of 60-feet from the safety of the ground. The windows and frames are scrubbed clean using brush heads incorporating low-pressure water jets. Purified water in itself is quite an aggressive cleaner as it always tries to get back to its natural impure state. Finally with a rinse of pure water the glass is left to dry to leave an excellent clean and sparkling finish. 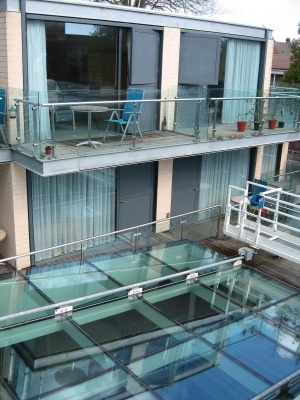 We also have a portable system to access areas where it is not convenient to run hoses such as internal courtyards and roof terraces.